Michael McFadyen's Scuba Diving - Entourage Reef, Queensland Great Detached Reef is located at the northern end of the Great Barrier Reef off Queensland, Australia. It is about 125 nautical miles (230 kilometres) from Thursday Island in the Cape York area (the pointy tip of Australia) and 75 nm (140 kilometres) from Lockhart River. The is 45 nm (85 kilometres) east-north-east from closest point of the Australian mainland, Cape Grenville. 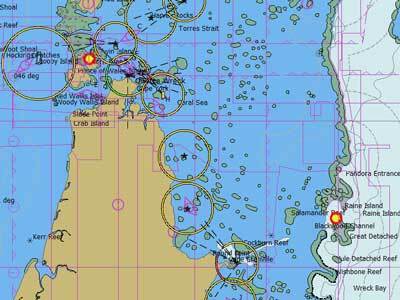 It is just over 4 nm south of Raine Island, the largest green turtle nursery in the world. 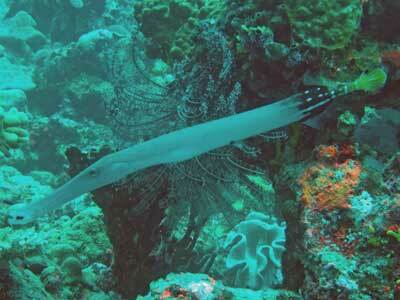 Entourage Reef is located on the western side of the Great Detached Reef lagoon. This side is mostly open but along this side there are a series of small reefs and bommies that runs from almost north to south. 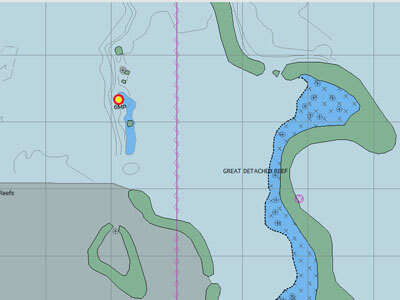 Its location is GPS S11º 43.929 E143º 58.530' which is 1 nautical mile south of 6MP and Da Phat. The reef is shaped like an upsidedown boot when you look at it from the anchorage on the south side. The depth on the top of the reef is about five metres and from here it slopes gradually to over 40 metres but on the north side it drops vertically to over 30 metres. Boats normally only anchor on the southern side of the reef, as this has the shallowest and largest area. This site normally has a current, but even if it is fairly strong, you only encounter it on about 10% or so of the site. The reef can easily be swum around in the one dive, but you certainly need to keep up a good pace, especially if you stay at depth. We went anti-clockwise, that is, we headed east from the anchor and then north up the short eastern side. This section as expected had a current, hence why we went here first so we were swimming into it. Once around the corner we swam along the northern side which really runs to the south-east. 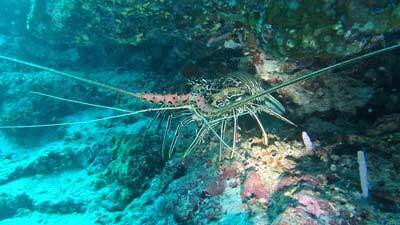 We stayed around 20 metres or so for most of the dive. Down here there are some nice gorgonias. The wall on this side is more vertical than the other sides. We see some sharks and Kelly found a huge painted crayfish. 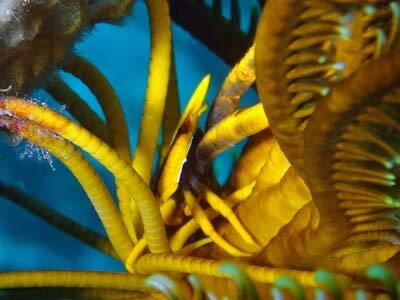 She also found a nice little crab on the legs of a feather star. There was a huge number of surgeonfish on this dive, mostly up near the surface. Even from the boat you could see them. 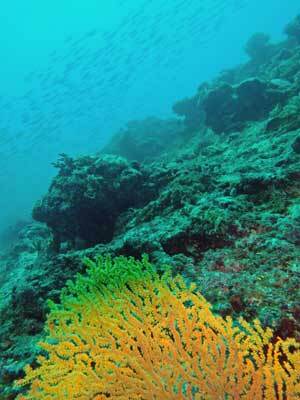 As the top of this reef is about five metres, it is a perfect spot to end your diving doing a long safety stop here. There is plenty to see on the reef including lots of anemones and clownfish. We dived here in November, the water temperature was about 28ºC, visibility about 20 metres except on the eastern side in the current. A nice dive site.